A newspaper man and his wife -- a bookkeeper -- plus their employees make up the Enterprise Printing Company family. Jim got his start in the printing business at age 15 when his dad bought a newspaper and print shop in Plainfield, Illinois. Jim studied journalism in college, and also became an apprentice printer. He and his family moved to Arkansas in 1979.
and materials that are known for producing superior results. For all of their customers, Enterprise Printing means quality and delivery on time or sooner than expected. Since its founding, Enterprise Printing has had the goal of being the standout printer in their geographical area. Until now, the reputation of Enterprise Printing has spread mainly by word of mouth. Jim sees the Internet as a way to meet new people and do what he likes best - give his business a "one on one personal touch." In their leisure time, Kathy enjoys sewing crafts and Jim loves fishing on Bull Shoals Lake. 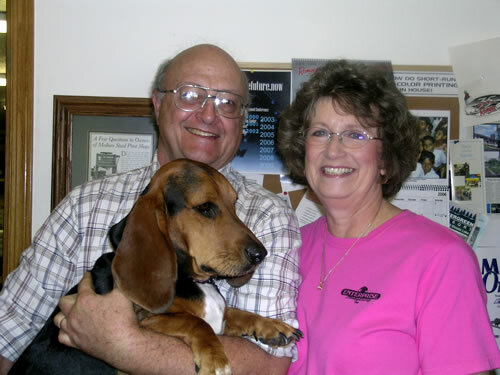 Owners Kathy and Jim Johnson and their Enterprise family want to hear from you - Boomer, too. Jim has great success bass fishing on Bull Shoals Lake at night.